Home » Writing 101 » Happy Day! 3. My parents want the children to excel in studies. As a result, if I have good results for the year, the whole family can go to the hawker centre to have meal. Even though it is only at the hawker centre, we (the children) are excited about it. I am a picky eater. Every time I go outside with my family, I order the same dish. My mother saves all the trouble of asking me what I want to eat. The dish is Char Kway Teow. You may see different spelling of the dish because it is in Hokkien (one of the Chinese dialects). Kway Teow is flat rice noodle. It is white. In Chinese language, we call it “河粉”。Char means stir-fried. Thus, Char Kway Teow is stir-fried flat rice noodle. The white rice noodle is stir-fried over very high heat with light and dark soy sauce until it becomes dark colour. It is commonly stir-fried with egg, prawns, cockles, bean sprouts and other ingredients. Different countries may have different variations. I like the Penang variation where only the white rice noodle is used. The Singapore variation is stir-fried the white rice noodle with the round yellow noodle. The reason why I do not like the Singapore variation is, I do not like to eat round yellow noodle. My friends have suggested me that I order “Char Kway Teow without yellow noodle” when I am at Singapore. But, isn’t it weird? Char Kway Teow means stir-fried Kway Teow, I do not ask for yellow noodle! 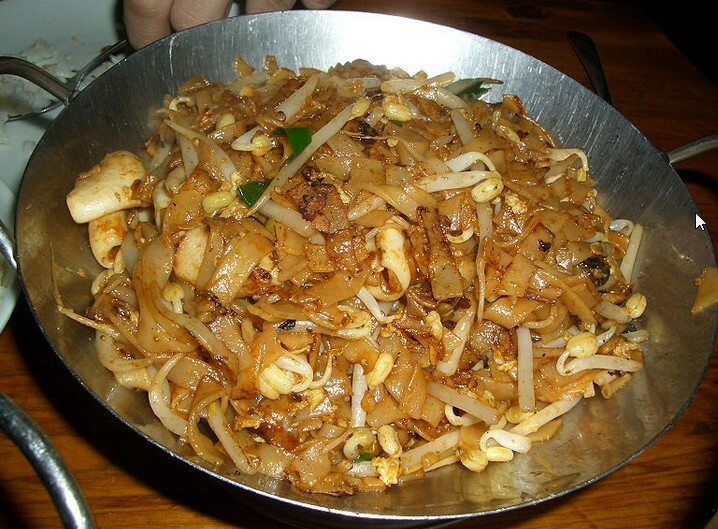 Char Kway Teow is best to be stir-fried in pork fat, which makes the dish smells good. Beware though, the dish is high in saturated fat. When I was younger, I ate some of the pork fat pieces. Now that I am older and more health-conscious, I still prefer those stir-fried in pork fat, but I choose not to eat the pork fat pieces. I love Kway Teow. Thus, I love Kway Teow soup too, another dish that uses Kway Teow. Kway Teow soup is healthier, plainer in taste and less oily. I normally have Kway Teow soup when I fall sick or when I want to have something light. Time spent: 30 minutes of continuous writing with picture. By Wendy in Writing 101 on 14/06/2014 . Thank you. I am glad my writing on the local food interests you. If you have a chance to visit Singapore or Malaysia, Char Kway Teow is a must-try.